Visit Ovation of the Seas’ dedicated page on the Royal Caribbean website, and you’re met with an evocative image of what is to be RC’s third Quantum-class ship, overlaid with the words ‘Arriving Autumn 2016’. For fans of Royal Caribbean’s ocean ruling and technology-stuffed Quantum-class liners, nothing could be more exciting. But what exactly can loyal Royal Caribbean fans expect from the new ship, and how soon can they book their first voyage aboard this rousing new vessel? To find out, here’s everything we know so far about Royal Caribbean’s latest Quantum-class ship, Ovation of the Seas. Get to know Royal Caribbean’s new ship with our handy Ovation of the Seas fact-file. Like Quantum of the Seas and Anthem of the Seas that took to the ocean before it, Ovation of the Seas is characterised by its state-of-the-art technologies, near-limitless amenities and ‘Dynamic dining’ options. Here, we give you the lowdown on all of the entertainment, features and dining opportunities available aboard Ovation of the Seas. 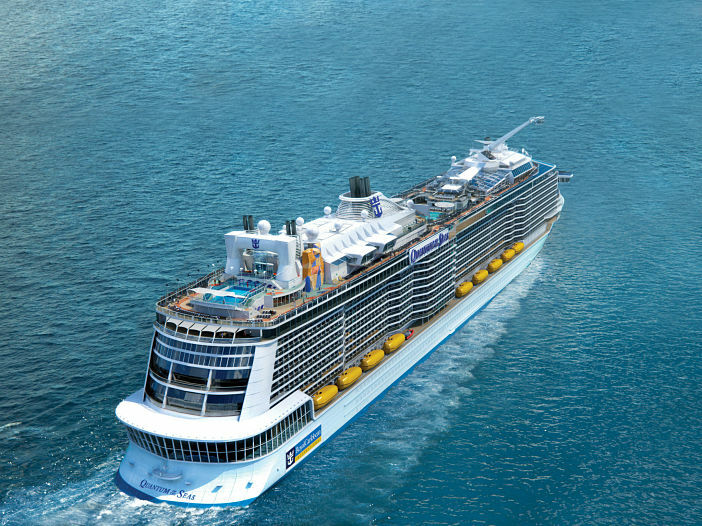 Upon developing the first Quantum-class ship, Royal Caribbean set out not to create the biggest vessels at sea – but the most technologically advanced. Thus, the uber-technical, space-age Quantum-class was born – hailing a new generation of tech-orientated cruising. Like its sister vessels, Ovation is chock-a-block with innovate tech designed to make everyday cruising more relaxing and more fun for the average cruise-goer. Smart Check-in: Own an internet-enabled tablet or smartphone tablet, and you can now check-in to your cruise anywhere, anytime thanks to RC’s new Smart Check-in functionality – meaning a lot less waiting at the terminal. The tech lets passengers take care of all the paperwork digitally, so you’ll never forget your boarding pass again. Plus, special RFID luggage tags mean you can track your suitcase as it makes its way safely to your stateroom. How’s that for peace of mind? RFID WOW Bands: No, you haven’t stepped onto the set of Star Trek; all Quantum-class ships feature RFID (radio frequency ID) WOW bands, which are essentially electronic wristbands that grant you access to your cabin, and allow you to make purchases aboard. When paired with the Royal IQ app, they can also be used to track the location of any passenger aboard – perfect for parents with wayfaring tots. Fast Broadband Speeds: Royal Caribbean are just one of the many cruise lines investing heavily in improving at-sea internet connectivity for its passengers. This means, guests cruising aboard Ovation can enjoy fast, reliable broadband, both in their cabin and in public areas around the ship. Royal Caribbean claim the service is speedy enough to handle everything from Skype calls to video streaming – helping passengers stay better connected to family and friends on dry land. For many seafaring passengers, the main appeal of a cruise holiday is to experience the raft of unforgettable on-board activities available on their cruise ship. Thanks to the limitless imagination, creativity and occasional lunacy of RC’s ship developers, Quantum-class vessels are crammed top to bottom with activities and entertainment capable of keeping 4,000 plus guests happy. RipCord by iFLY: As the world’s first at-sea skydiving simulator, iFLY’s RipCord has proved extremely popular since it was launched aboard Quantum of the Seas – attracting many an adrenaline junkie and part time thrill-seeker. In short, RipCord is a vertical wind tunnel, which allows riders to “float” on a 100mph wind cushion. Take it from us – this isn’t one for the faint-hearted. North Star: Featuring an all-glass pod that’s raised 300 feet above the waves, Ovation’s North Star grants passengers never-before-seen vistas of the ocean, as well as unforgettable views of the destinations the ship visits. First added to Quantum of the Seas, North Star is extremely popular, and takes guests on an remarkable journey atop the high seas. Bionic Bar: Delicious cocktails? Check. Bar stools? Check? Thirsty punters? Check. So – what makes the Bionic Bar different to other watering holes aboard Ovation? The answer: robotic bar staff. That’s right, visit Bionic Bar aboard Ovation, and you’ll be served the cocktail of your choice by a fully automated bartender. Tipping not required. Don’t ask us why, but food and cruising seemingly go hand in hand. Perhaps that’s why, Ovation of the Seas is home to twenty-two unique dining venues, each serving an array of delicious dishes to suit any palette. As a Quantum-class vessel, Ovation is among the few Royal Caribbean ships to implement the controversial “Dynamic Scheme” – something the line says offers greater flexibility for cruise passengers. Silk: Serving a delectable selection of pan-Asian dishes, Silk aims to transport diners on a culinary journey across the Far-East. The restaurant offers a comprehensive range of Asian-inspired appetisers, entrees and desserts – each reflecting the flavours and tastes that has made Asian-food beloved across the globe. The Grande Restaurant: Sample the gastronomy of a bygone era by booking a table in the nostalgia-strewn Grande Restaurant. Characterised by its timeless-yet sophisticated dishes and sumptuous interior décor, The Grande Restaurant is the perfect place to sample some of the best fare of the sea in beautiful, formal surroundings. Jamie’s Italian: Combining the joy of Italian cuisine with the contemporary flair of famed British chef, Jamie Oliver, Jamie’s Italian encapsulates the passion, originality and spirit of Italian cookery in a bold and exciting way. Choose to dine in Jamie’s Italian during your cruise, and you can look forward to feasting on the usual Italian favourites – pizza, pasta, lasagne – as well as contemporary dishes developed by Oliver himself. After journeying across the world to its homeport of Tianjin, China, Ovation of the Seas will travel to Australia to spend the 2016-17 summer season offering ten to fifteen night sailings from Sydney to New Zealand. Bookings for the ship’s maiden cruises in Australian waters are already been taken, with thousands pre-registering their interest in reserving a place aboard the ship. Here, we’ve listed the four sailings Ovation of the Seas will offer during the 2016/17 season. If you’re interested in booking a cruise break aboard Ovation of the Seas, click here to visit our dedicated page. For further information the ship, or any of the specific sailings listed above, please call the Cruise1st Australia team today on 1300 857 345.